Sea lice cause significant issues in the mariculture of salmonids. 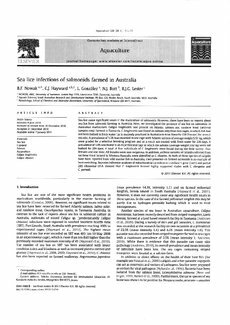 However, there have been no reports about sea lice from salmonid farming in Australia. Here, we investigated the presence of sea lice on salmonids in Australian mariculture. Caligus longirostris was present on Atlantic salmon and rainbow trout (archival samples only) farmed in Tasmania. C. longirostris was found on salmon only from two cages, in which fish had not been bathed in fresh water (as is routinely practiced in Australia to treat Amoebic Gill Disease) for several months. A prevalence of 1.5% was recorded in one cage with Atlantic salmon of average weight 5.51 kg, which were graded for a selective breeding program and as a result not treated with fresh water for 236 days. A prevalence of 1.9% was found in an experimental cage in which the salmon (average weight 5.62 kg) were not bathed for 294 days. A total of five individuals of C. longirostris were found during the field survey—four females and one male. All females were non-ovigerous. In addition, archival samples of caligids collected from rainbow trout farmed in Western Australia were identified as C. chiastos. As both of these species of caligids have been reported from wild marine fish in Australia, their presence on farmed salmonids is an example of host-switching. Bayesian Inference analyses of mitochondrial cytochrome c oxidase 1 gene (cox1) and partial 28S ribosomal DNA showed that C. longirostris formed highly supported clades with C. elongatus and C. gurnadi.